Now that I've been paid, I can start shopping again! Okay, it will mostly be for presents for other people, but that won't stop me from compiling a new wish list. I must be depressed by the increased darkness, because most of what is on it is bright bright bright. I'm usually a person who dresses in various shades of black, grey, and beige. Maybe I should put a SAD light on the list as well. 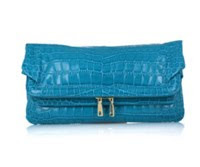 This turquoise DKNY clutch would be perfect for all my Christmas party needs. Buy it at Net-a-Porter. Not bright enough for you? This yellow purse would be like carrying a wee chunk of the sun in your handbag. Available from Avril Gau. I don't under understand why House of Harlow keeps selling out the instant any of the online shops get the pieces in stock, but I do quite like this bracelet at My-Wardrobe. I think it would look fab layered with my gold Missoma charm bracelet and the Hermes horse bit choker I wear as a bracelet. I have officially worn out my black studded Ash trainers - yesterday found me hunched on Buchanan street with a shoe full of water that had entered through the hole in the sole. So, I've replaced them with these white patent leather Converse ones at Net-a-Porter. The collaboration I'm most excited about this year is the Mawi jewellery for ASOS. Even when Mawi appears in Cocosa's secret sales, it's still too expensive! I like pretty much everything they've done for this collaboration, but this necklace in particular stands out to me. 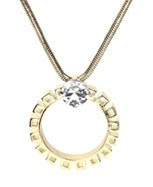 Alternatively, for a bit less I could get one of the many 80s inspired necklaces from the Gogo/Topshop collaboration. Cognisant of the fact that I will be walking miles and miles all over London at Christmas, I'm looking to get an additional pair of comfortable shoes. I'm thinking these ones by Nine West at Kurt Geiger. Okay, so they're mostly black, but everything else on my list is bright, so I think it's the exception that proves the rule. Oh, and a black cardigan by Splendid at Net-a-Porter. That proves the rule too. But, I'll just apply some of my MAC strobe cream to lighten up all that black I'll inevitably continue to wear.